The Yellow Centerline . . . The search for wildflowers within city limits leads the urban naturalist to the edges, the fringes, and the medians. 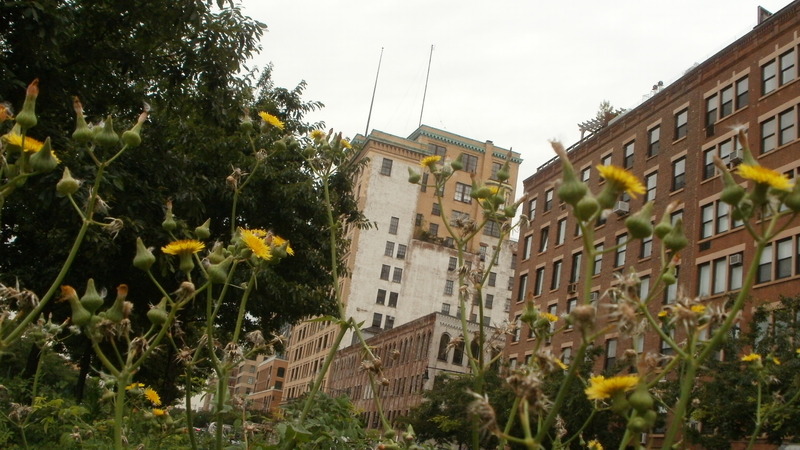 Median strips are one of the best places within a city to find wild plants in bloom. Variety and quantity are both possible because the green strips between roadways are often public, yet maintained only sporadically, two factors that allow wild plants to reach the flowering stage. The borders I drew for the Wildflowers of the West Village contain two sizeable median strips. The first is located east to west on West Houston Street. The other one runs north and south between the frantic lanes of the West Side Highway. I was exploring the middle oasis of the latter when I discovered scattered stands of plants about waist high with sharply lobed leaves that displayed the chalky blue and green coloration of cruciferous vegetables like broccoli and kale. The upright blooms borne on sturdy smooth stems consisted of yellow gold florets supported by a ribbed calyx shaped like an urn. There were so many opening buds that the median had become a living yellow centerline. My first reaction was to find a name for the colorful faces I was greeting for the first time. 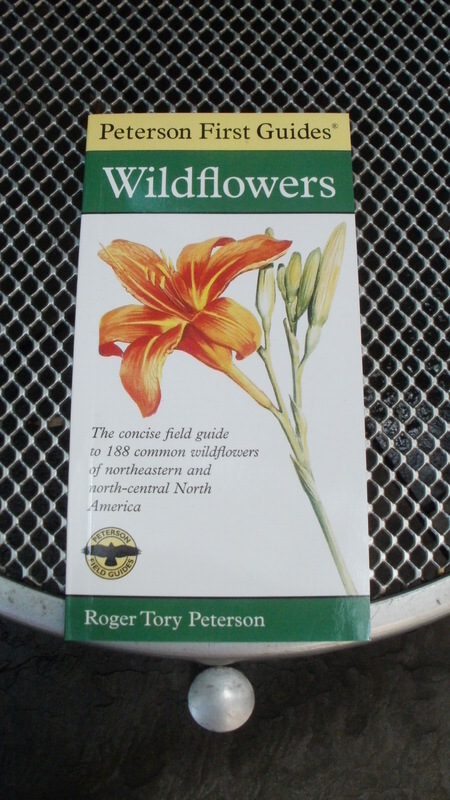 The quick reference I carry is Wildflowers by Roger Tory Peterson, the condensed version that is part of the Peterson First Guides series. This edition is narrow, perfect for the back pocket, and the species are arranged in color-coded sections, which is probably the single-best organizing principle for flowers. Peterson and his books have been a part of my life since I was a grade school nature boy. He himself was a native New Yorker, born in Jamestown in 1908, and later a resident student in New York City proper. His body of work is extensive, earning him a rightful reputation as one of the greatest naturalists and outdoor artists of the Twentieth Century. Peterson is regarded primarily as an ornithologist and illustrator; his Field Guide to the Birds being the standard of the genre. He authored, co-authored, and illustrated numerous other titles, including the vast Golden Guide series: little hand-sized books I read and reread, with images I contemplated so often and long I could, in some cases, see and read the pages in my mind’s eye. I have not internalized my condensed version of Wildflowers to such a degree, so I flipped through my copy right there between the lanes of the West Side Highway. The yellow section lead me right to an exact match on the bottom of pages 52 and 53: the Sow Thistle, Sonchus oleraceus. As with most thistles, this one is a Eurasian immigrant from the extended daisy family. 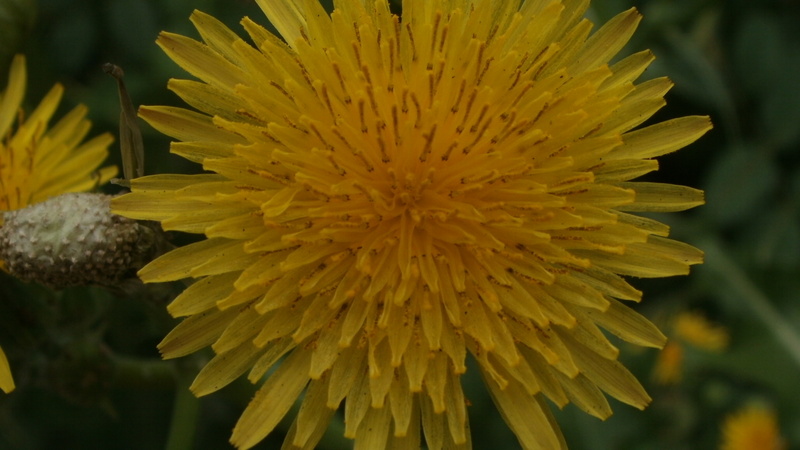 The basal rosette from which the plant rises, its toothed leaves, and the composite bloom of yellow florets all bear a close resemblance to its cousin, the dandelion. Both wildflowers are members of Asteraceae. The Sow Thistle’s blooms are hermaphroditic and go to seed in the familiar form of white parachutes that take to the wind and spread far and wide. 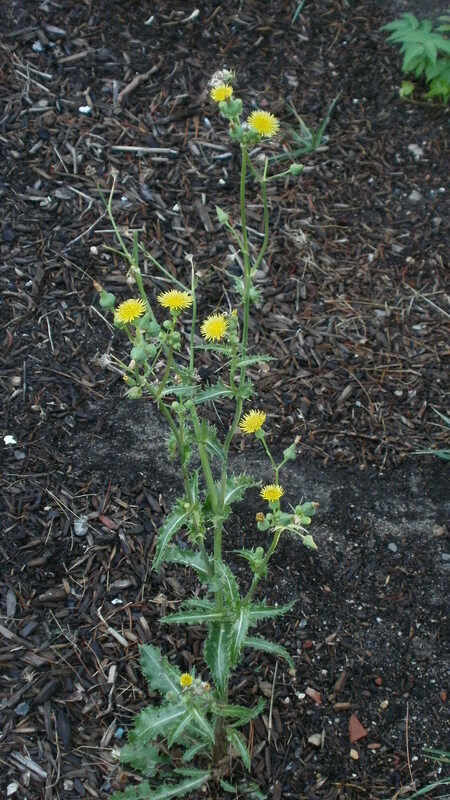 Like other ruderal species, the plant can take root wherever a seed lands, including the often neglected narrows of roadway medians. The cruciferous look of the sow thistle’s leaves advertises its edibility. Serve fresh with balsamic vinegar for a mildly bitter salad green akin to endive. When steamed, the flavor becomes closer to Swiss chard. As with most wild greens, the younger leaves near the top of the plant possess the most palatable flavor and texture. Those near the bottom, although more substantial in size, become stringy and bitter with older age.